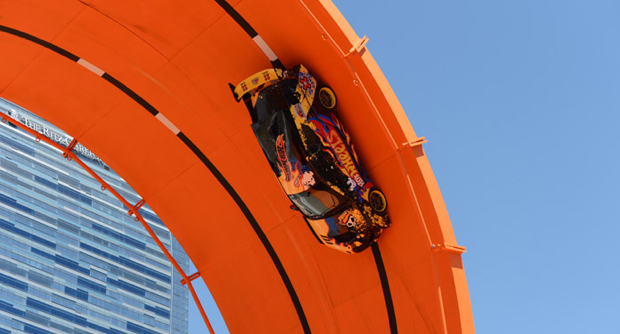 When Hot Wheels sets up life-size racing loops at ESPN's X-Games, you know something amazing is about to happen. Something we could only dream of when we were kids pushing our Hot Wheels cars around that famous orange racing track. And from my experience, every loop-dee-loop I attempted ended up as a spectacular crash and burn -- but hey, that was the whole idea! But rally car driver Tanner Foust (three-time X Games rally-car gold medalist) and Hollywood stuntman Greg Tracy showed the X Games Los Angeles spectators (and the world) how it's really done by pulling Seven G's (seven times gravity) while driving two Hot Wheels cars through a double, 66-foot tall loop-dee-loop track. And this isn't the only amazing car stunt Hot Wheels has been doing. Here's a cool video of Hot Wheels Team Blue taking on the Wall Ride test and passing it with flying colors.